Low Voltage Component, Magnetic Latching Relay, 24VAC/24VDC Control. 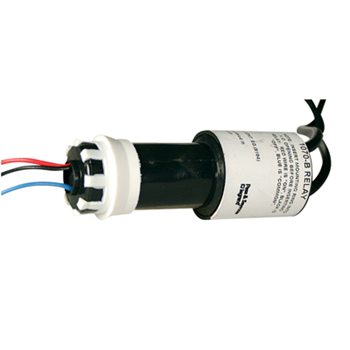 Reliable field-tested switching circuitry that provide central or local control of lighting loads. Mount in standard 1/2" KO through noise suppressing nylon ring. Maximum ambient temp: 140°F (60°). Insulated flame retardant nylon shell. Prestripped 5-1/2" (140mm) #22 AWG leads for easy wiring. Split coil design energizes ON coil to close line contacts, and OFF coil to open contacts.